My mother owns a 40 piece Shelley butterfly wing tea set. There is one cup, missing unfortunately. I understand the butterfly wing is quite rare. Could you tell me: is it still collectable and what sort of value does it have? Thank you, Dianne, for sending these photos to me. It is a privilege to be able to advise you on your Shelley tea set. Shelley’s name is synonymous with superior quality and there is still a very healthy market out there and hundreds of serious collectors who would love to own a set like this. 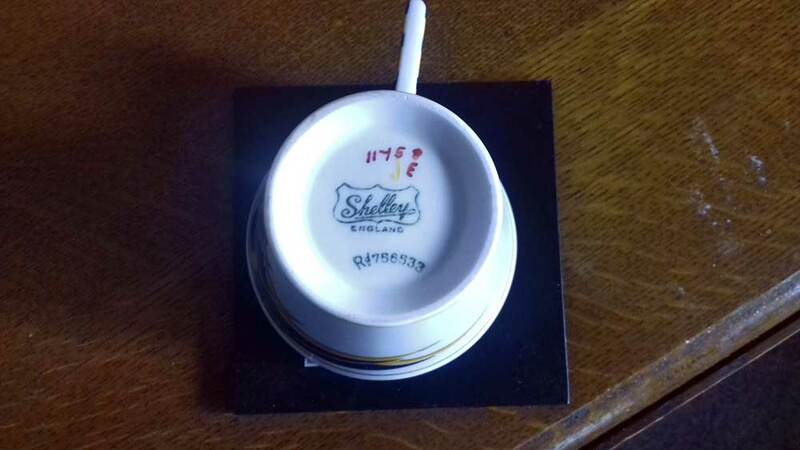 Shelley is one of the very best English potteries that produced bone china. Their wares are all beautiful works of art in their own right, and yet were made to be used and enjoyed. Shelley had such thorough quality control that their China patterns all matched, the colours were perfect and their pieces were incredibly durable (for porcelain!). Together with this high standard of manufacturing, Shelley is also highly prized by collectors, as it ticks more than one box. 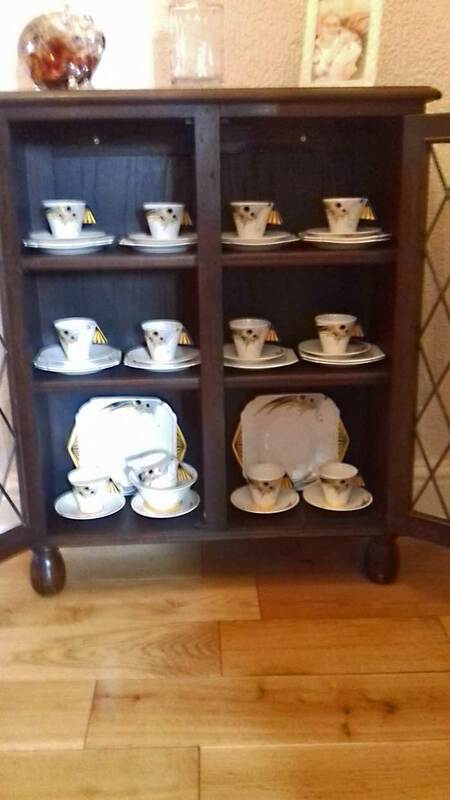 Shelley symbolises the Art Deco period so well that when selling a tea set like this, collectors of art deco are just as likely to buy it as are specialist Shelley collectors. They are very loyal collectors and always on the look-out for new pieces. This is a lovely set and someone out there would love it. Your sophisticated tea set is a real gem. The Butterfly Wing pattern is striking with bold flashes of gold and black. It was made in the early 1920s and Shelley were market leaders at this time. To have a forty piece set, nearly complete and in good condition is really something to be proud of! Well done for looking after it so well over the years. A forty piece set would usually comprise of 12 cups and saucers, 12 side pates, 2 larger cake plates, a milk jug and a sugar bowl. Unfortunately, you say that there is one cup missing and this is a real shame, as when a cup is missing or broken, it drastically effects the value of the set. The broken cup affects the value immediately as collectors would obviously prefer a full set, but there are people out there who will or can compile a set from many different oddments. It may be that a new cup can be found to replace the broken one. There are many reasons why Shelley is still so popular with collectors from all over the world. Aside from the quality, the original pattern books still exist. This means collectors can tie up the pattern numbers to the artwork the pieces were decorated with. For lovers of details, history and research, this ticks all the boxes. There are large international Shelley clubs full of experts that can help with identification of pieces. There are also many other sources of information about Shelley: the internet, magazines, newsletters and books which can all be a haven of information about this amazing company. Finally, as Shelley in no longer in production, supplies are dwindling which makes sets and pieces even more sought after than they were (say 20 years ago). For would-be collectors, Shelley is a very rewarding field. There is much fun to be had in researching the various designs and patterns. As well as this type of design, there are also nursery wares, floral designs, deco styles and the wonderful chintz style we see with royal Winton, so there are lots of opportunities to specialise. Shelley produced many different designs over the years and they were at their height when they released their retro ranges in the 1920s, 30s and 40s. These boasted geometric shapes and very bright colours and sets from this period, in good condition, can fetch about £600 at the moment. Shelley has been established since the mid19th century. The Wileman family already owned a Staffordshire pottery, but in 1860, they opened a second factory which was to specialise in producing the finest china. At this point, James B. Shelley joined the company to work as a salesman. By 1870, Henry, the head of the Wileman family and his son, James Wileman had died. now, James Shelley took over the management of the china works and became a partner in the business. They had traded under the name JF Wileman and subsequently Wileman & Co, but after a dispute over the ‘Foley’ name, they finally became Shelley potteries Ltd in 1925. This was about the time your butterfly set was produced. By the end of the 1950s, Shelley was fast losing its market share to cheaper manufacturers. in 1966, the business was sold. Sadly, Shelley is now no more. you know it’s a fairly new example. cost you about £200. For that reason, it may be worth seeking out a single cup to complete the set. GB Antiques Centre stresses that valuations given are an indication for insurance purposes only and are not necessarily what the item would sell for. Readers should also note that valuations are based on submitted photographs and any additional information provided by their owners. These valuations are intended to be indicative, not conclusive.